In a masterclass from the Catalans' captain, he first equalised with a brilliant volley from 16 yards. He levelled for a second time with a curling shot from the edge of the box. 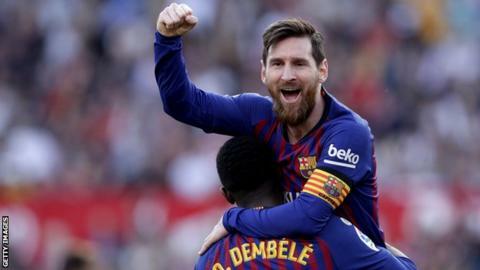 Messi then chipped Tomas Vaclik for his third, his 36th goal in 35 games against Sevilla, before setting up Luis Suarez for an injury-time fourth. It really was a one-man show with Barcelona not playing particularly well as they extended their lead over second-placed Atletico Madrid, who host Villarreal on Sunday. Sevilla - who are out of form - took the lead twice in the first half from a Jesus Navas counter-attack strike and Gabriel Mercado's eight-yard finish. At the age of 31, Messi shows no signs of slowing down. His treble takes him up to 25 La Liga goals for the season, an average of one every 75 minutes. He is nine clear of Suarez in second place and almost twice the top scorer of any other team, Cristhian Stuani's 13 for Girona. In all competitions, he has 33 goals in 32 games - including six in the Champions League as Barcelona chase the treble. His third goal was his 650th career strike - 585 for Barca and 65 for Argentina. All his goals were excellent with his first, a left-footed volley from Ivan Rakitic's cross, a contender for goal of the season. His second was a fine curling effort with his right foot from Ousmane Dembele's pass. And, with five minutes to go, he clipped the ball over the goalkeeper after Carles Alena's shot was blocked. Late on he played an excellent ball over the top for Suarez to end a five-game goalless run. Match ends, Sevilla 2, Barcelona 4. Second Half ends, Sevilla 2, Barcelona 4. Goal! Sevilla 2, Barcelona 4. Luis Suárez (Barcelona) right footed shot from the centre of the box to the bottom right corner. Assisted by Lionel Messi with a through ball. Roque Mesa (Sevilla) wins a free kick on the right wing. Roque Mesa (Sevilla) is shown the yellow card. Corner, Barcelona. Conceded by Simon Kjaer. Attempt missed. Franco Vázquez (Sevilla) left footed shot from the centre of the box is high and wide to the left. Attempt saved. Sergi Gómez (Sevilla) header from the centre of the box is saved in the top left corner. Assisted by Pablo Sarabia with a cross. Corner, Sevilla. Conceded by Marc-André ter Stegen. Attempt saved. Wissam Ben Yedder (Sevilla) right footed shot from the right side of the six yard box is saved in the bottom right corner. Goal! Sevilla 2, Barcelona 3. Lionel Messi (Barcelona) left footed shot from the centre of the box to the bottom right corner. Attempt blocked. Carles Aleñá (Barcelona) left footed shot from outside the box is blocked. Assisted by Sergi Roberto. Jordi Alba (Barcelona) wins a free kick in the attacking half. Attempt blocked. Carles Aleñá (Barcelona) left footed shot from outside the box is blocked. Corner, Barcelona. Conceded by Sergi Gómez. Hand ball by Gerard Piqué (Barcelona). Attempt blocked. Lionel Messi (Barcelona) left footed shot from the centre of the box is blocked. Substitution, Barcelona. Carles Aleñá replaces Coutinho. Corner, Barcelona. Conceded by Tomás Vaclik. Attempt saved. Lionel Messi (Barcelona) left footed shot from outside the box is saved in the top right corner. Attempt blocked. Wissam Ben Yedder (Sevilla) right footed shot from the right side of the six yard box is blocked. Assisted by Jesús Navas with a cross. Attempt missed. Lionel Messi (Barcelona) left footed shot from outside the box is just a bit too high. Assisted by Ousmane Dembélé. Franco Vázquez (Sevilla) is shown the yellow card for a bad foul.